When he arrived at work, his boss was missing. What had happened to him?! Joe was a few minutes late for midnight shift at go-go’s. He had just started walking across the parking lot, wasn’t even in the C-store yet, when it struck him: Mr. Habib was nowhere in sight. Everything else in the convenience store was clearly visible through the wall of glass running almost the entire store width; a panorama of full shelves, roller grills, frosted cooler doors, and drink stations. The only thing missing was Mr. Habib. Frankly, Joe should have been relieved that the owner of go-go’s wasn’t pacing back and forth ready to rip into him for being tardy, calling Joe an “undisciplined college boy” or similar epithet while doing so. But Joe didn’t feel relieved. The owner’s car was in the otherwise empty lot. It was unlike him to leave the register unattended. A flush of heat surged through the graduate student even though he was standing in the deep chill of a 40 degree autumn night. 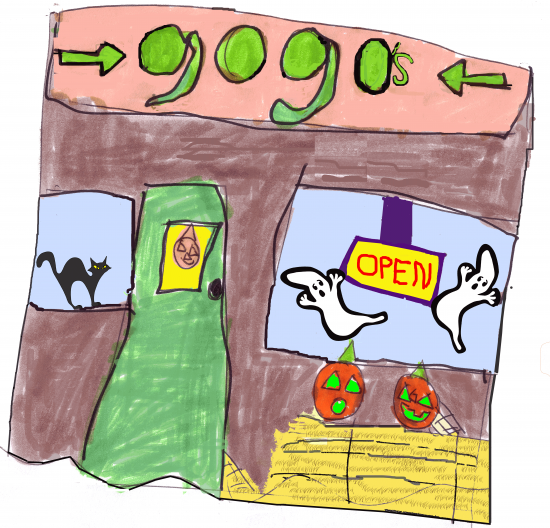 Bathed in the ghostly glow emanating from the storefront, he had never felt more alone. The business had once been on a busy thoroughfare, but that was before the freeway bypass had turned into what was essentially a country store out in the sticks. Usually the isolation suited Joe just fine. It gave him time for background reading, research necessary for his dissertation. “Why am I just standing here?” he muttered to himself and began walking forward, trying to shake the case of the jitters that suddenly possessed him. He approached the door, greeted by the by-now familiar litter of Jack O’Lanterns with sickly green glow-stick leers. Atop the hastily assembled pile of hay bales, they looked downright hungry. He opened the door. The security system’s chime greeted him. “Mr. Habib!” he called out. No answer save for the hum of refrigeration. “Mr. Habib, are you in here?” He said it a little louder this time, but the result was the same: nothing. As if that wasn’t spooky enough, it looked like both registers had been ripped out of the counter. The cables and wires left behind dangled like tentacles. The theft, if that’s what it was, that didn’t make sense to Joe. Mr. Habib, thrifty to a fault, used terribly outdated technology. No one would want that stuff. Having no viable alternatives he could think of, Joe kept moving, along the shiny counter on his left, taking a right when he reached the sandwich rack, then down the hall past the employee restroom to the owner’s office. The door was open and he thought he heard a moan. It took all his effort not to turn and run, but he wished he had when he saw what lay before him on the office floor.